Days of Wonder brings us one of their all-too-rare but much anticipated brand new game releases. 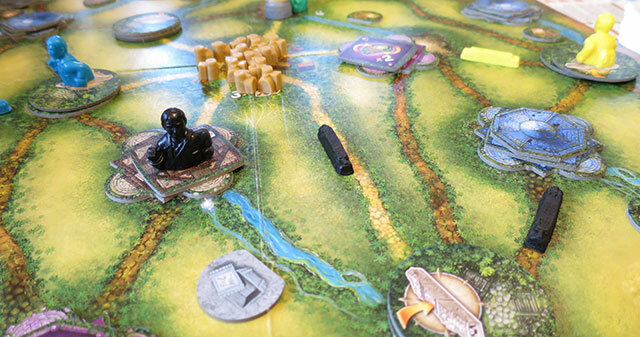 Disclaimer: Days of Wonder kindly provided me with a review copy of Relic Runners. I’m an Indiana Jones fan. Big time. For my 40th birthday party, I turned an inner-city terrace into as close an approximation of a Raiders of the Lost Ark film set as I could (given a slightly smaller budget), including a grey-painted beach ball wedged in the corridor and two ceiling-high carved and painted polystyrene temple columns leading to the backyard. Everyone dressed up as characters from the films and it was an excellent evening. So any game that features archaeology and adventure is a must buy in my book, and when it’s created by one of my favourite publishers, Days of Wonder, it’s a cause for celebration. But does Relic Runners live up to the hype? We put our top men—our top men—on the case to find out. I hardly need open with the fact that Relic Runners is a gorgeous production, given the standard of quality we’ve all come to expect from Days of Wonder. While many other publishers focus on cutting corners with cardboard box inserts and thinner card, DOW explores ways to enhance the physical quality of their games. The most obvious example of this in Relic Runners are the relics themselves: individual colourful plastic creations bursting with character that look like they should each come bundled with a candy bar. These are components that anyone else would probably represent with a counter, or perhaps a wooden meeple shape, but not at DOW. When you win one of these in the game you really feel like you’ve achieved something. Similarly, the artwork throughout by regular DOW illustrator Julien Delval is bright, colourful, and upbeat, and everything is designed with the kind of attention to detail that—as a graphic designer who’s done a few games myself—gets my heart racing. The only thing not perfect—and it seems churlish to mention it—is that the wells for the tiles in the plastic box insert aren’t quite deep enough for the tile stacks that sit in them. But I’m clutching at straws to find something to criticise; it’s yet another delightful-looking game from Days of Wonder. So how does it play? Well, briefly, there are a number of mechanics working together to make up Relic Runners. Each player starts with an explorer sheet (one side gives you a special ability), an explorer miniature, 3 ration packs, 3 toolboxes, and a set of pathway markers. The first thing players do is head out from the central space (‘base camp’) into the jungle, building a network of personal pathways and exploring temples and ruins. Your turn is a simple move, followed by an explore action. You may move along one jungle and river pathway on your turn, but when you explore a green ruin space by spending a ration pack, you discard one of the ruin tiles and place one of your plastic path markers on an adjacent path. This allows you, in future turns, to move along that path for free, before or after your one space move. So later on in the game you could end up, for example, moving one space, then travelling along a connected five spaces that all have your path markers on them. Not only can you explore ruins, but there are blue, purple and ivory temples to visit as well, each consisting of three differently-sized tiles. The blue ones are all facedown and give you a number of secret, bonus victory points. The top tile of the purple stacks are the only tiles revealed at the start of the game, and you reveal the next one in the stack when you take one. They give you various immediate advantages, such as repositioning a pathway, or taking the action of an adjacent ruin or temple. And finally, the ivory temples give you persistent powers, but you can only keep one of each size. Since there are more tiles in the game than those you put on the board when you set up, the combination of all these tile abilities changes greatly from game to game. You quickly run out of the three ration packs you start with of course, but you can end any move at base camp to collect another three. If you get too adventurous without planning ahead you can find yourself stuck out in the jungle and forced to waste a move or two to get back there. During set up, colour toolbox counters are place beside specially marked paths. When you pass one of these, you flip the counter to its monochrome side, and may move one of your plastic toolboxes on the toolbox chart on your explorer sheet. This chart consists of three columns, each of three spaces. During your turn you can choose to use the special ability of a space on which you have a toolbox, afterwards moving the toolbox back to the bottom of the chart. So there are nine different special abilities you may be able to use during the game; but of course the ones at the top of the chart are better than the ones at the bottom, because they take longer to reach. So, you create linked pathways that allow you travel about the board more and more efficiently, while grabbing tiles with points and special abilities on them, and occasionally moving your toolbox up the chart to get further abilities. So why is it called Relic Runners? Well, because when you turn over the last tile of a stack you place a relic of the matching colour—blue, purple, ivory or green—on the space. Now, if you start a turn on a space with a relic, and can travel in one move to another space that has a relic of the matching colour on it, you not only collect the relic in the final space, but you score points equal to twice the number of paths you moved. This is when your sneaky planning pays off, as you try to pull off the longest ‘run’ and collect the most points. You’re also trying to get a variety of relics, because at the end of the game you get five points for each different type of relic you have. So if you have three green relics and one blue relic, you only get ten points, but if you have a green, a blue and a purple relic, you get fifteen points. Those of you who have viewed my unboxing video could probably tell I was very excited about playing this game; but I must be honest and reveal that when I played it the first time, I came away a little underwhelmed. The guys at DOW are some of the nicest in the business, and I would have hated to give the game a ‘meh’ review. Thankfully, with further plays, though it remains a light, family-oriented, luck-heavy game, it also reveals more variety and enjoyment and some strategy as you get to know it better. In fact, I seem to win quite frequently, which is strange considering how hopeless I usually am at planning ahead in games; and that leads me to suspect that scoring is often a matter of luck rather than good planning. You can definitely chain a few powers together to do tricky things and pull off a good ‘run’ at the end of the game, but due to the fact that almost all the tiles are facedown at the start of the game, it’s hard to plan to achieve a particular combination of abilities. The toolbox powers feel a bit like an added extra; I find myself wanting to use them more but never quite getting enough of an opportunity. Other players are revealing relics and getting powers that will completely modify your plans, which is fun, but makes any strategy very reactive. In my interview with first-time designer Matthew Dunstan back in October, he mentioned that DOW applied the theme to his design. And I think the game has a slightly piecemeal feeling, of several mechanics and their thematic justifications fitted together in an effort to please everyone. It’s a little safe, a bit too slickly targeted to the broad gaming market. I’d love DOW to take some big risks with their next game. For example, “let’s make a really cool game about Indiana Jones-style adventure” rather than “let’s wrap an Indiana Jones-style adventure theme around these neat mechanics”—but that’s probably more to do with my desire for a game that really captures my favourite theme! Relic Runners is a very well-designed, well-produced game. 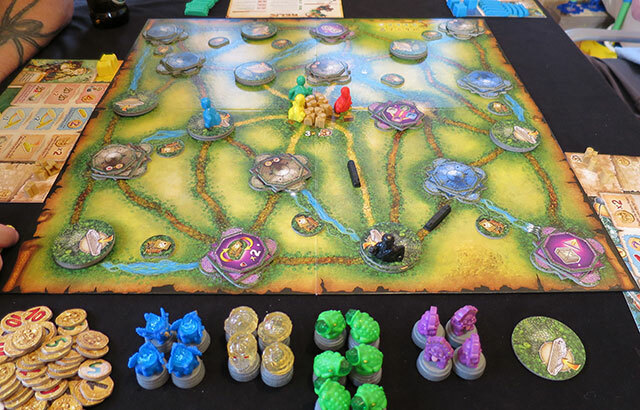 It has all the elements you could ask for in a DOW game, everything you could want in a modern board game designed for a wide audience and a variety of ages; and I definitely think you should give it a few plays to really discover what it has to offer. DOW’s production design is beautiful and clever, because the iconic relic tokens are, to the casual buyer, more memorable than game mechanics. However… there’s still just a little bit of something missing. It’s that indefinable magic that makes you want to get a game to the table again and again. It might have something to do with the difficulty of creating a strategy because of the hidden and random elements and plethora of abilities, or maybe just the fact that the theme has been—albeit expertly—pasted on to the mechanics. Relic Runners is another beautiful and enjoyable DOW game and an impressive design from a first-time designer, though I think it joins the company of titles such as Cargo Noir and Colosseum rather than classics like Ticket to Ride and Small World. What do you think? No time to argue—throw me the idol; I throw you the whip! Thanks for the great review. I’ve been on the fence with this one, and I think I’m still on it. I too like the theme, and I’m a big fan of the production value of DOW games. Ticket to Ride is always fun, no matter what group I pull it out for, but to me Small World got stale really fast; I know I’m probably in the minority with that opinion; maybe I’m not playing it right, but oh well. Anyway, Small World failing to capture my affections has made me a bit hesitant toward more purchases from DOW, and even though I WANT to like this game, I’m just not there yet. Great review, none the less. Keep up the good work. No, I’m probably with you—Small World is fine, but after the base game I didn’t feel the need to buy any expansions. It all depends on one’s personal taste of course, because it is hugely popular.